Every data that you store pose a risk of damage, theft, corruption and many other treats. But the worst situation is when you delete that important data yourself by accident. In every single situation, your worries increase because you lost an important data with the simplest mistake. But don’t worry, it not the end of the World for you. The data might be deleted but not lost forever. You can use the most reliable data recovery software, which is EaseUs Data Recovery Software. It is software that will allow you to easily and quickly recover deleted, lost or formatted data from various storage spaces. Accidental Deletion: The software will help you to recover the files that you accidentally deleted due to negligence. If you deleted the file because you thought you won’t need it again and now want to restore it, you can do it all with EaseUS. Formatted Disk/Drive: It will help the users to get their data from a formatted disk. Not that much people know that formatting a disk or drive doesn’t erase the data instead it only deletes the data on the address table. Thus, you still have a chance to recover that formatted files from your storage. 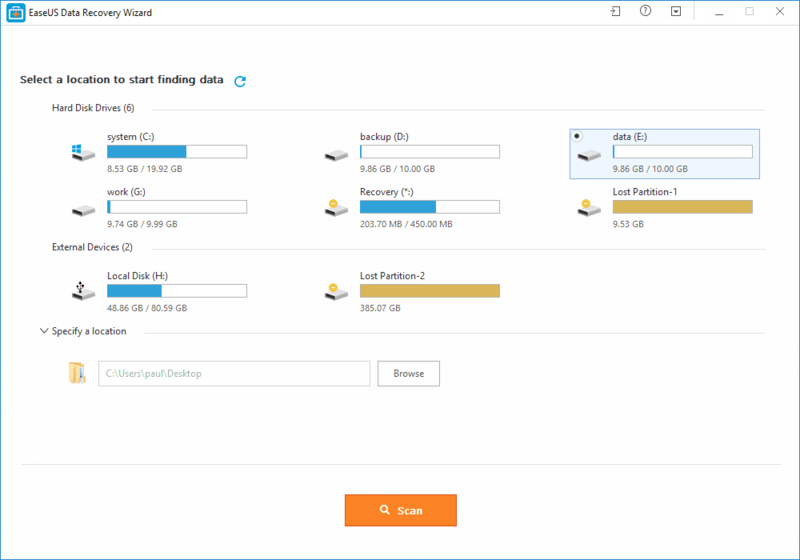 Empty Recycle Bin: The EaseUS software can easily scan the files from an emptied Recycle Bin and help the users to retrieve data as soon as possible. All the files that have been deleted recently will show up instantly, to get some old files, you might have to run a deep scan of the Emptied Trash Bin. Lost Partition: Sometimes due to unknown reason the partition of the hard drive gets lost and become inaccessible. But you don’t need to worry that much because with the software you can even recover the lost partition of your hard drive. Hard Drive Damage: As the hard drives can be connected to multiple devices, it is more prone to damage. The connection to multiple devices can corrupt the hard drive and results in loss of data. But with the help of the software, you can recover all the data files again. Virus Attack: Not even a single storage space is secured from a virus attack and they can even affect your system working to a great extent. So, using the software as soon as possible to recover your data with safety is the best option for you. Operating System Crash: The reason for System crash can be any but to recover your system and get the important files back is a really tough task. The EaseUS software is complete file recovery software that can recover data files even after your OS crashed. RAW Partition Recovery: in some severe cases, the partition of the hard disk or system becomes RAW and the stored data and file becomes inaccessible. But with the software, you can regain access to the partition. Hence, using the EaseUS data recovery software is the ideal choice for your data file recovery. It is a comprehensive solution for your lost and deleted data. The software supports more than 1000 different types of file including document, graphics, videos, audios, photos, music, emails, and many other files. The software is available in a different version. There is a free version available for the users along with two paid version. The free version is enough to get your data back to your system. But if you want to have the benefit of some additional features, then you can opt for the premium version.